While I don’t have exact figures, just the prominent positioning of the Alamos Malbec in the Costco wine section is quite telling in itself. Costco certainly didn’t become the largest retailer of wine in the world by not knowing what they were doing! It’s right up front, just as you approach the wine section, for good reason. This particular bottle of Alamos Malbec was actually brought to my house for a party we recently threw and was actually an unopened leftover – so instead of letting the bottle collect dust I thought I would give the 2014 vintage of the Alamos Malbec a shake. Looking for tips on where to buy wine? Check out my Comprehensive Guide! Appearance: A very dark garnet red. Nose: Intensely aromatic, the Alamos Malbec wafts from the glass with juicy dark berries, prunes and plums interlaced with fresh cracked pepper and subtle hints of spice and roasted meat. 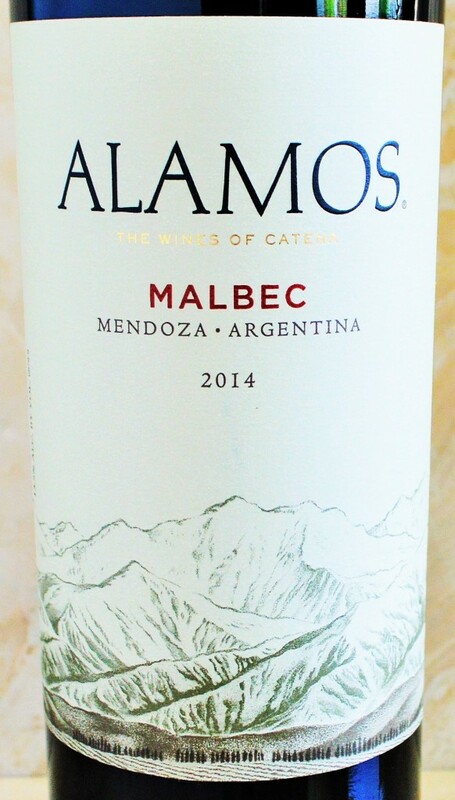 On the palate: The Alamos Malbec 2014 is medium-bodied and smooth in the mouth. There are juicy, savory yet tangy dark fruit notes along with a pronounced streak of cracked pepper carrying this through to the lingering, slightly meaty and spicy finish. This vintage wants for a bit more depth and focus, but is still altogether very enjoyable. Where to get it: Available in both the Costco Wine Section and Trader Joe’s Wine Section, as well as most grocery and liquor stores. You can even enjoy a glass of Alamos Malbec at select Starbucks locations with the Starbucks Evenings menu. Should you buy? The 2014 Alamos Malbec is undoubtedly a solid value. It offers a lot of plush character in a very approachable, quaffable package. This would be a respectable party pour or BBQ companion. 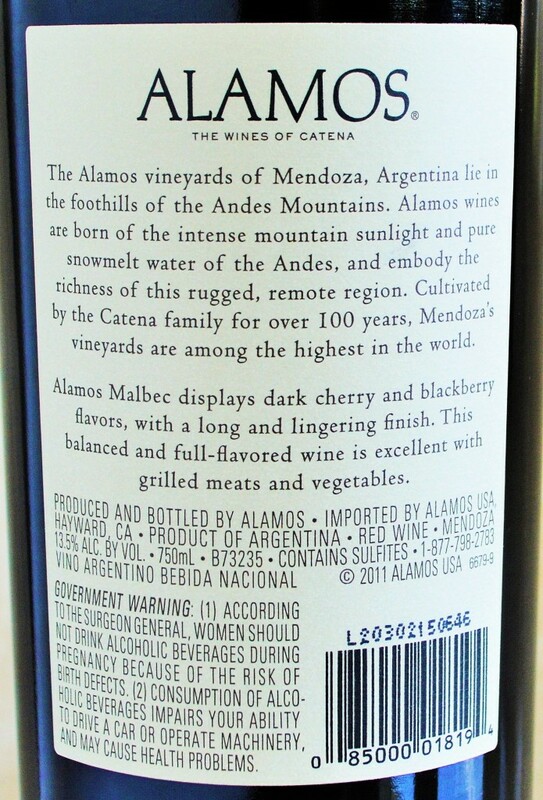 However, if you’re sensitive to peppery or meaty notes in wine, then I would steer clear of the Alamos Malbec. 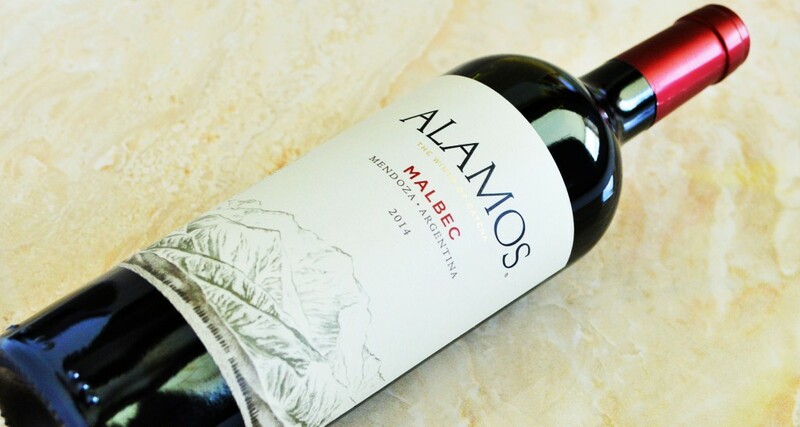 This 2014 vintage of the Alamos Malbec is so fresh off of the boat from the Alamos Winery in Mendoza that they hadn’t even updated the wine’s specs on the Alamos Website. The website does however state that “The Alamos winemaking team aims to make wines that are as good as wines twice their price.” A bold mission statement for sure, and frankly I’m not convinced that the Alamos Malbec tastes like a $15 wine to me, but it does taste like decent $10 wine for sure. So while I might usually make the argument that you should avoid falling victim to Costco’s clever product placement strategy and look past the Alamos Malbec for more interesting alternatives, this is undeniably a decent wine for $7. However, I don’t believe it’s as compelling a value as its overachieving reputation would have you believe. Thank you for your review. Much appreciated as usual. Decanter reported 2014 vintage was a challenging. I think with value wines like the Alamos that are consistent from year to year, they are more often then not noticeably better in good vintages. Comparing the much better 2013 vintage would be interesting. I would assume 1-2 points better. But inrestingly, this seems not always the case @ the $15-$20 price point, where more concentrated wines sometimes benefit from cooler non ideal growing season. The 2012 Bodega Norton Privada (Bordeaux blend) would be a good example, which is also at Costco. The 2012 year brings out some feminine characters in the wine. The kirsch and dark chocolate tasting is toned down and the acidity and tanins are more balanced. I would be interested on your review if it’s available at your Costco. On your second point, I think that has a lot to do with a matter of taste. Many people are looking for the deeper, riper, more concentrated flavors – while others want a more restrained, food-friendly package. It is a pretty polarizing subject. I find that I love both, but there is a time and place for each. On that subject, I have been finding the 2011 Napa Cabernet’s (a vintage that many are poo pooing) to be refreshingly approachable, balanced and interesting with a dose of healthy acidity. They also happen to complement a meal rather than overpower it generally speaking. I will have to pick up the Bodega Norton Privada on my next Costco run – thanks for the recommendation.